Regiment: Royal Garrison Artillery 45th Anti-Aircraft Coy. 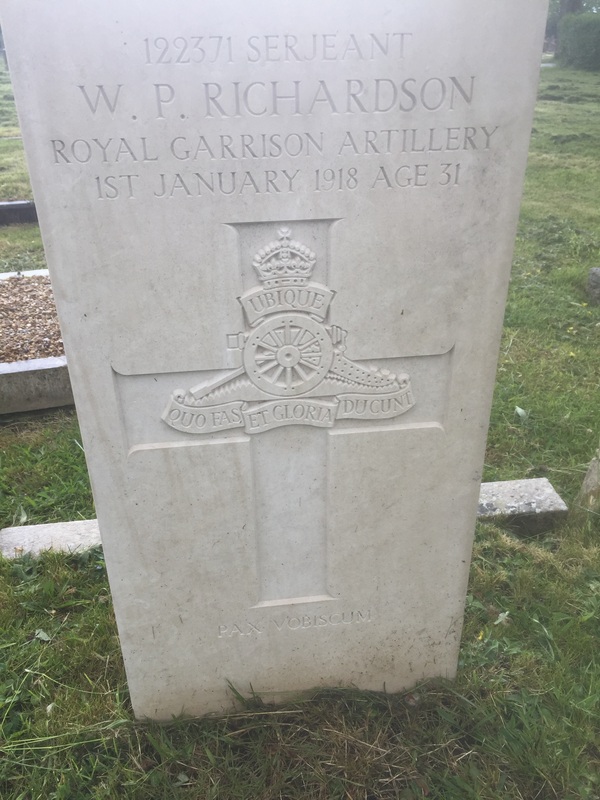 William Richardson was a sergeant in the Royal Garrison Artillery. He never saw service at the front and was killed when a mine he was examining on the beach exploded. William Pryor Richardson was born at 78 Clyde Road, Preston, Brighton on 9 October 1886, the first child of Samuel Thomas Barber Richardson (1862–1929) and his first wife, Sarah Jane née Pryor (1862–1893). Samuel, a greengrocer’s assistant, and Sarah married in Brighton in 1884 and their first child, William, was born two years later. The couple had two more children, Thomas born in 1889 and Mabel born in 1891 before Sarah died in 1893, aged just 31. Samuel re-married, to Ellen Louisa Heather (1864–1939), in 1895 and had two further children, Allen born in 1896 and Ellen born in 1897. At the time of the 1901 census, 14-year old William was living with his father and step-mother and his four siblings at 29 Belfast Street in Hove, when he was working as an office boy. 10 years later, William was still living at Belfast Street and was now working for Hove Borough Council as an “electricity clerk”. On 20 August 1913, William married Elizabeth Jane Hutton (born November 1887) in St Peter’s Church in her home village of Petersham near Richmond, Surrey. The couple’s only child, William Eric Richardson, was born at Hove on 21 May 1915. At this time, the family were living at 14 Erroll Road, Hove. William was initiated into St Cecilia Lodge No 1636 in the Royal Pavilion at Brighton on 28 March 1916, passed to the second degree on 31 October and raised to the degree of master mason on 12 December 1916. Having previously spent four years with the Sussex Yeomanry, William enlisted at Brighton on 16 November 1915, joining the Sussex Royal Garrison Artillery as a gunner with service number 875 (later changed to 122371 with the RGA). He received regular promotions, becoming a corporal on 30 September 1916 and reaching the rank of sergeant on 4 September 1917. His entire career in the army was spent on coastal defence in England and he never served on the front line. At the end of 1917, he had been posted to the 45th Anti-Aircraft Company of the RGA, based at the Old Haven Gun Station at Sandwich Bay in Kent (at 51°16’06″N, 1°23’12″E). At 11:45 in the morning of New Year’s Day 1918, Sergeant Richardson and five soldiers were killed when a mine they were examining on the beach near the gun station exploded. As well as the six men who were killed, about 24 more were injured and considerable damage was caused to neighbouring houses. The following day, the coroner held an inquest into the deaths. Gunner Frederick Wilkins stated to the inquest that between 8:30 and 9:00 a.m. he was on look-out on the beach when he spotted an object floating in the sea. He pointed this out to Sergeant Richardson who went to the hut and said “Now boys, here is another tub of margarine”. Several of the men then went down to the beach but could not get to the object which was still over 30 yards offshore. Sergeant Richardson then returned to the beach to look at the object through his field glasses and decided that the object was a mine. He ordered Wilkins to report to the coastguard that there was a mine floating in the sea and that Sergeant Richardson claimed any reward that was due. Sometime later that morning, Wilkins and other men went into the water, attached ropes to the object and pulled it onto the beach. Wilkins then returned to the hut to change his socks when he heard an explosion. Gunner John Glover then reported to the inquest that when Wilkins came into the hut, he and another gunner decided to go to the beach to see what was happening. When he reached the scene, he saw several soldiers around the object, including Gunner William Bentham who started to tamper with the “brass part of the object”. He turned to his colleague and said “I don’t like seeing them tamper with that thing, as we don’t know whether it’s dangerous or not”. They decided to get away from the scene at which point Sergeant Richardson returned. The sergeant then knelt down to examine the object when it exploded killing four men and fatally wounding two others. The coroner’s jury returned a verdict of “Death from misadventure” adding that the “lamentable” loss of life occurred as a consequence of not carrying out instructions, and that the soldiers should not have touched the object until it had been examined by the proper military authorities. As well as Sergeant William Richardson the men who died were Gunner 93755 William Bentham (aged 26) (RGA) and Privates 351088 Albert Audus (aged 26) and 32919 Leonard Crouch (aged 19) (both of the 16th Argyll & Sutherland Highlanders). Bombardier 124753 Henry Asbridge (aged 29) and Gunner 102012 Frederick Wain (aged 24) (both RGA) died later that day in hospital. William Richardson was buried at Hove Old Cemetery (Grave Reference: T.B. 322) and is commemorated on both the Brighton and Hove war memorials. His grave bears the words “Pax Vobiscum” (“peace with you”). William’s widow, Elizabeth never re-married and died at Hove in 1973, aged 85. Their son, William Eric married Claire Ferris in 1938, and died in Swindon in 1996, leaving a son, Keith, born in Brighton in 1938.